Polio is non curable and there is no polio treatment available , bed rest during the acute stage and avoidance of injections, corrective surgery and physiotherapy along with rehabilitation helps the patient. Physiotherapy is a cornerstone of management of polio and post polio syndrome. There is an increasing evidence base for the effectiveness of physiotherapy in alleviating PPS (post polio syndrome) associated physical problems. Patients with prior polio or post polio syndrome should have access to regular physiotherapy assessment, and treatment should be made available when needs are identified. Spinal Paralytic poliomyelitis: In this the motor neurons in the anterior horns of spinal cord are affected. Paralysis is usually asymmetrical, predominantly involves proximal muscle with pain and tenderness. Most commonly it affects the leg. Extent of weakness can vary from a single muscle group to complete tetraparesis. Bulbar Paralytic poliomyelitis: It occurs due to damage to the medulla, pons and midbrain with dysfunction of the cranial nerve nuclei and respiratory and vasomotor regulating centres in the medulla. It can lead to respiratory muscle failure, distress of respiratory control, dysphagia, dysphonia and dysarthria. Cardiovascular, sweating and gut mobility disturbances may occur. Bulbospinal paralytic poliomyelitis: It is also known as respiratory poliomyelitis. It has symptoms both of spinal cord and bulbar poliomyelitis. It affects the part of spinal cord C3 to C5 segments and causes paralysis of the diaphragm. Dysphagia and respiratory failure follow. Polio encephalitis: There is inflammation of motor neurons within the brain stem, motor cortex and the spinal cord. It leads to the stiffness of back and neck, muscle cramps, headaches and paraesthesias. Paralysis occurs within 10 days after symptoms develop progress in 2 to 3 days and complete by the time fever subsides. 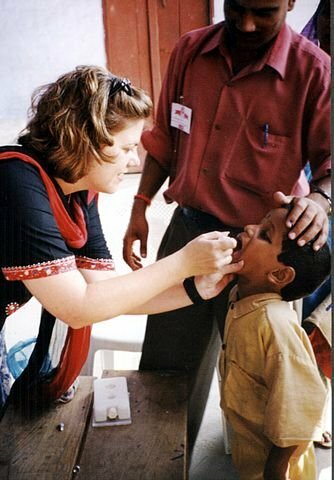 There are many symptoms of polio and not everyone will experience all of the symptoms. They symptoms vary according to the type of polio the individual has. In mild polio, some of the symptoms are: headache, nausea, vomiting, general discomfort or a slight fever for up to three days. In nonparalytic polio (aseptic meningitis): the symptoms are similar to mild cases, with the addition of moderate fever, stiff neck and back, fatigue and muscle pain. The symptoms for polio and paralytic polio different. Individuals with paralytic polio experience tremor, muscle weakness, fever, stiffness, constipation, muscle pain and spasms, and difficulty swallowing. Stage 1: Acute stage of paralysis: : it begins with fever and headache, followed by neck stiffness and meningitis. Muscles are painful and tender. Paralysis soon follows and reaches its maximum in 2-3 days. Limbs are weak and there may be difficulty with breathing and swallowing. If the patient does not succumb to respiratory failure, pain and pyrexia subsides after 7-10 days and the patient enters the convalescent stage. Stage 2: Recovery/convalescent stage: : This stage is prolonged. The return of muscle power is most noticeable during the first 6 months, but there may be continuing improvement for up to 2 years. Stage 3: Residual paralysis: : Some cases do not progress beyond the early stage of meningeal irritation. In others, however recovery is incomplete and the patient is left with some degree of asymmetric flaccid paralysis or muscle weakness. Feet to be supported by rigid boards at 90˚ angle. Early spinal bracing for the back if it is weak. Reduced pulmonary function results from the virus affecting the medullary respiratory centres, the muscles of respiration and the cranial nerves. Each child will have a different combination and severity of paralyzed muscles and will have his own special needs. For some children, normal exercises and play may be all that are needed. Others may require braces or other aids to help them move about better. Those who are severely paralyzed may require wheelchair. During the stage of residual paralysis following problems may require polio treatment. Isolated muscle weakness without deformity: Quadriceps paralysis may make walking impossible, it is best managed with a splint which holds the knee straight. Elsewhere, isolated weakness may be treated by tendon transfer. Deformity: Unbalanced paralysis may lead to deformity. At first it is passively correctable and can be counteracted by a splint. Fixed deformity require tendon transfer and joint stabilization, if necessary by arthrodesis. Flail joint: If the joint is unstable or flail it must be stabilized either by permanent splintage or by arthrodesis. Shortening: Lack of muscle activity undermines normal bone growth. Leg length inequality of upto 3 cm can be compensated for by shoe modification. Anything more may require operative lengthening of the limb. A child with foot drop can be given an ankle foot orthosis of plastic or metal. A child with weak knee may need a long-leg brace of plastic or metal. It may be with or without a knee joint that locks straight for walking and bends for sitting. Child with weak trunk may require long leg braces attached to a body brace or body jacket. Individual children should be protected by immunization with polio vaccine. Two types of polio vaccines are available, an inactivated (killed) injectable polio vaccine (IPV) and a live attenuated (weakened) oral polio vaccine (OPV). Both vaccines are highly effective. During early phase of the illness, it is difficult to evaluate the extent of paralysis because of pain and spasm of the muscles. Paralyzed muscles generally recover power to a variable degree. About 5-10% of the patients may develop bulbar or respiratory paralysis. Though bulbar paralysis is not invariably fatal, many patients succumb to it. Prognosis is generally worse for the older children and in those who had a sudden onset of illness with high fever.